Financial experts are anxiously guessing when the next recession will hit, with all eyes on the Federal Reserve as they raised interest rates four times in the last year. We’ve enjoyed a long, healthy economic expansion in recent years, but recessions are simply part of the natural ebb and flow of economics. 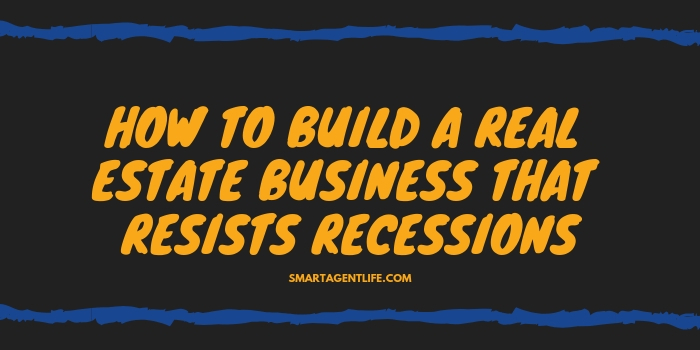 When the next recession does hit, is your real estate business prepared to stay afloat? If you look at what happened during the last recession, you might ask yourself the same thing. From 2007 until 2014 (peak recession times), over 94,000 agents dropped out of the real estate pool – or about 35%! But now that the market has been on the upswing, so have the number of active agents, adding more competition with less chance of survival during the next recession. Build multiple income streams to increase your revenue. Real estate agents have a unique financial situation. Most agents work solely on commission, with a median annual salary of just $40,333. Yet agents are working tirelessly to close deals, score listings, and provide their services. Often, real estate agents focus only on the physical listing and selling of properties because that’s where the money is. Sure, It’s the bread and butter of real estate, but working with buyers and sellers limits your revenue potential. For starters, you can only sell as much as your time allows (you’re a person, not a machine). You invest countless hours showing properties and driving all over town, but don’t always have a sale to show for it. Revenue diversification isn’t a new tactic to build wealth, but it’s often one of the most underutilized by real estate agents. Some agencies add rental properties to their suite of services to earn a little extra revenue. But this isn’t always profitable. If you’re not already known for rental services, it will take some time to build up your rental base. Plus, marketing, admin, and management fees will quickly eat into any revenue and might not make it worth your while. The same goes for home staging, home services, and property inspections. Any time you’re adding a service to diversify your revenue, you face similar challenges. Services require physical activity, which means your time is your limit. Also, you’re investing in marketing to promote these services, which cut into your profits. The best way to diversify your income as an agent is to find passive revenue sources that can bolster your income with minimal or zero time commitment or other expenses. Passive income for real estate doesn’t mean you’ll never have to sell again. But eXp Realty’s model can help you supplement your sales commissions without adding time-consuming services. Using the world’s first cloud-based brokerage, our business model treats you more like a real estate partner rather than an independent agent. You earn company shares with your very first transaction, along with shares when you reach your cap and when your agent referrals make their first transaction. Agents also earn residual income each year from agents they sponsor into the company, along with any agents brought in by your sponsored agents. 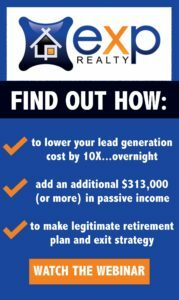 There’s no limit on the amount of revenue you can earn through this share-based model, all without any additional home-selling on your part. Our revenue-sharing model helps to remove some of the financial stress real estate agents experience when markets are low and they don’t know when their next sale is coming. There will be another recession, whether it’s a few months from now or after the next presidential election. Regardless, real estate agents should focus on how they can build financial security in their careers, not only to carry them to the next real estate boom but also help to create a sustainable future. Find out more about the revenue-sharing model and start recession-proofing your career!